Even as lawsuits challenging its admissions policies made their way through the courts, the University of Michigan carried the torch for affirmative action in higher education. The University's position on affirmative action was vindicated in June 2003, when the Supreme Court ruled that race may be used as a factor in university admissions programs. The Court thus upheld what the University had argued all along: diversity in the classroom translates to a beneficial and wide-ranging social value. With the green light given to the University's law school admissions policies, Defending Diversity validates the positive benefits gained by students in a diverse educational setting. Written by prominent University of Michigan faculty, Defending Diversity is a timely response to the Court's ruling. With chapters that explore the factual background, historical context, and psychosocial implications of affirmative action, the book illuminates the many benefits of a diverse higher educational setting, demonstrating why affirmative action is necessary to achieve that diversity. Defending Diversity is a powerful contribution to the ongoing discussion on affirmative action in higher education. Perhaps more important, it is a valuable record of the history, events, arguments, and issues surrounding the original lawsuits and the Supreme Court's subsequent ruling, and helps reclaim the debate from those forces opposed to affirmative action. Patricia Gurin is Professor Emerita, Department of Psychology, University of Michigan. Jeffrey S. Lehman , former Dean of the University of Michigan Law School, is President of Cornell University. Earl Lewis is Dean of Rackham Graduate School, University of Michigan. "Defending Diversity documents the extraordinary effort made by the University of Michigan to defend its race-sensitive admissions policies against a determined legal assault. Drawing liberally from supportive testimony from business, the professions, and the military and from extensive empirical research, the University makes a powerful case to demonstrate how much racial diversity matters to the quality of education and to the future of America. At a time when university leaders are often criticized for failing to speak out on important public issues, the successful campaign mounted by these Michigan officials seems al the more remarkable." "Readers interested in broad historical and social analysis of affirmative action will appreciate this book." ". . . provides a framework and model to moderate dialogues across America about diversifying the states' public flagship universities. . . . Data and conclusions presented in Defending Diversity support the notion that wide-ranging and positive benefits exist where students interact and learn from each other when lines of race and ethnicity intersect. 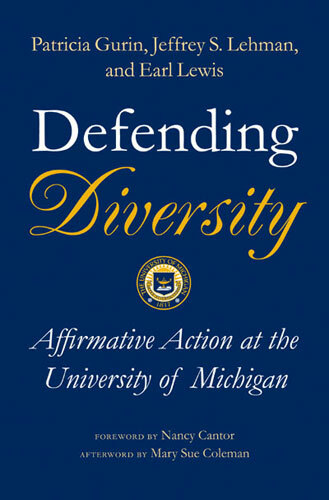 Defending Diversity tells the encouraging story of the University of Michigan's role in constructing a diverse democracy and its place in the nation's history in mounting a successful defense of affirmative action before the Supreme Court."